On December 13. Chuck Schuldiner passed away in Florida. For several years now we have known that this might happen, but receiving this message still came as a shock. I didn't know Schuldiner in person, but I did a few interviews with him by telephone, and I also had the pleasure of meeting him in Germany in 1993. This article is meant as a walk through Schuldiner's career, while at the same time trying to pay tribute to this outstandingly skilled and special musician, the likes of which you will find only very few. Charles Schuldiner was 16 years old when he established the band Mantas in co-operation with Frederick DeLillo and Barney Lee in 1983. The band released a demo tape in 1984, "Death by Metal", which was spread around the underground community and created a small stir. That very same year the boys changed the name to Death and recorded a second demo, "Reign of Terror". In 1985, they had recorded yet another tape, "Infernal Death", but things were still going slow for the band. Chuck didn't manage to keep the band members for long, and the fact that Chuck was moving all over the USA didn't make it any easier. In 1986, Death was more or less a duo consisting of Chuck and drummer Chris Reifert and their debut was recorded in Los Angeles. "Scream Bloody Gore" wasn't released until march 1987, but Death marked themselves as a band to reckon with in years to come. Chuck did move back to Florida and got several of the Massacre members to tour for Death, and thereby Rick Rozz (Frederick DeLillo) was back in the band. A year later the band released "Leprosy", which to many is looked upon as one of the most definitive death metal records of all time. After a while, Chuck Schuldiner and Rick Rozz got on bad terms and Rozz was replaced by James Murphy (who later became known for his performances in both Obituary and Testament.) At this point Death also consisted of Terry Butler (bass) and Bill Andrews (drums), both whom had actually been with the band since the "Scream Bloody Gore" tour. It finally seemed as if Chuck had regained some sort of stability in his crew, but it wouldn't last for long: After the release of "Spiritual Healing" in 1990 the band was supposed to tour Europe with Kreator, but Chuck went home after a few gigs and the band had to continue touring with a roadie performing the vocal parts. Everything was rather quiet around the band until the fall of 1991, when Chuck a sealed a new record deal with Roadrunner (Relativity / YK) which resulted in the majestic "Human". Chuck had an entirely fresh crew, consisting of Cynic members Paul Masvidal (guitar) and Sean Reinert (drums) as well as Sadus bassist Steve DiGiorgio. "Human" displayed a whole new Death, as the music was far more technical and intricate than before - from the youthfully naive and raw death metal to far more sophisticated tunes. And perhaps even more brutal than ever before. Once again trouble arose on the European tour which ended up with Pestilence never joining the tour. The band played at Alaska (now Betong), Norway, supported by Loudblast and Norwegian act Cadaver. In 1993 Chuck managed to recruit Andy LaRocque on guitars and Gene Hoglan on drums. 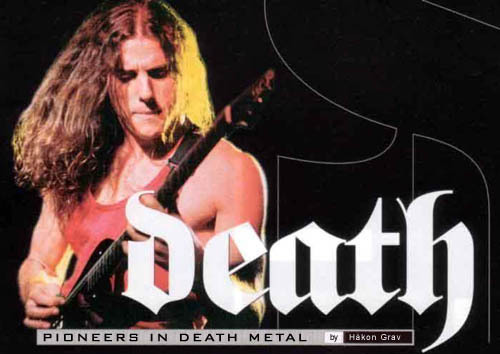 "Individual Thought Patterns" is definitively my favorite Death album, and the combination of Chuck Schuldiner and Andy LaRocque is hard to surpass. After 1995's "Symbolic" things quieted down around Schuldiner, until he suddenly turned up with "The Sound Of Perseverance" in 1998. Once again a new crew was introduced: Shannon Hamm (guitar), Scott Clendenin (bass) and Richard Christy (drums, now playing in Iced Earth). At the same time Chuck was 'pregnant' with his long awaited project, Control Denied, which soon became his main priority. In addition to Chuck, Shannon and Richard, Steve DiGigiorgio was now back together with vocalist Tim Aymar. "The Fragile Art Of Existence" was released in 1999, and this was the last album that Chuck Schuldiner had the chance to experience being released. At this point he was aware of the difficult times he had ahead of him and he did only a very few interviews. I was one of the lucky few that had the chance to talk to him about this album. But one can not deny the fact that there was a dark veil hanging over the phone line at the end of the conversation. "Right now the days are spent on waiting. In December I will return to New York for several examinations, and there will be performed x-ray scans of the cancer, which hopefully has decreased (...) I need a lot of peace and quiet these days but I write a lot of music. Even if the situation is far from good, one has to cross the fingers and hope for the best. Chuck - a difficult person? I was supposed to make a phone interview with Chuck after the release of "Individual Thought Patterns". He told me to call back in five minutes, and then he put the answering machine on. A few months later I met him in Ludwigsburg, Germany. As I arrived at the Rockfabrik I met a stressed out tour-manager. The time of the interview did not at all match what was agreed on beforehand. He begged of me to accept it, and that's the way it became. Fifteen minutes later I met Chuck, I introduced myself and asked why the interview was moved several hours in advance. He didn't know anything about that and if it was ok by me, he would perform the interview right away. After a thirty minute interview, I was invited on a flipper tournament. Certainly no bad feelings there. Several journalists had problems with Chuck, amongst others the German Rock Hard had a bad conflict going on for years. Anyhow, it's nothing new to us that a person has both good and bad periods in his private life and in the interviews I had with him there were no problems at all. I don't know Chuck Schuldiner as a private person but I do know him as a musician, where he is in a league of his own. Experiencing Death on the '93 tour is one of the best concert memories I have, and the fact that I missed them on Dynamo '98 is one of my biggest mistakes. I guess it's a situation where one has to treasure the things one did get to experience. In the same way, there is no reason for us to look into the abyss - Chuck Schuldiner is dead, but it is not him we should feel sorry for any more - it is his family, friends and fans that are struggling with the loss. But why focus on the loss when the reward of Schuldiner's music and personality will be standing for all time to come? Chuck crossed his fingers and hoped for the best and after two years of radial and chemical treatment, medicine at the experimental stage and alternative medicine, maybe it was all for the best the he was relieved from his pain. I talked to Richard Christy at Wacken in 2000 and he told me that quite a lot the second Control Denied album was in construction. And there is probably a lot of other material lying around in drawers and closets that Chuck never had the chance to realize. Let's hope that someone handles it with respect and make a decent box etc, so that Chuck's family may collect some more money and thereby pay off the enormously large bill that the American hospitals demand from them. Rest in peace, Charles Schuldiner, and thank you for the many years of immortal music! I will do my part so that you will be mandatory knowledge for future generations to come. Chuck was a big fan of other bands including Iron Maiden and Judas Priest, and not to mention King Diamond. In several interviews he mentioned that he adored the music of King Diamond, especially the guitar work of Andy LaRocque. Andy tells us about his experiences with Chuck: Chuck was a huge fan of King Diamond, but honestly I didn't know a whole lot about Death at the time. He invited me to Florida to record "Individual..." and we had a great deal of fun during the weeks I was over there. Chuck made sure everybody had it comfortable and it was a very positive experience with a total and mutual respect. We talked over the phone a few times through the years but I didn't meet him again until 2000, also in Tampa. I was very happy to see him again and all things considered he was fine. At the time he had been through a brain operation only about half a year ago, but he was in a good mood and driving the car by himself.